This page of the bibliography covers single-author books by Laird Barron. "Procession of the Black Sloth"
"The Royal Zoo is Closed"
Cover illustration by Eleni Tsami. The collection was nominated for a Bram Stoker Award (2008, collection). It was nominated for an International Horror Guild Award (2008, collection). It was a finalist for the William L. Crawford - IAFA Fantasy Award (2008). It placed 15th in the 2008 Locus Awards in the collection category. It won the 2008 Shirley Jackson Award for the best collection. The story "Hour of the Cyclops"was included in the limited hard cover release of The Imago Sequence and Other Stories but not in subsequent hard cover editions, or the electronic edition. It IS included in the trade paperback edition, but it is NOT listed on the copyright page or the table of contents. Cover art by Matthew Jaffe. The collection was nominated for a Bram Stoker Award (2011, Collection). It placed 18th in the 2011 Locus Awards in the Collection category. It won the 2011 Shirley Jackson Award for Best Collection. Cover and interior art by David Ho. The Croning cover art by Cody Tilson. El Rito translated by Rubén Martin. El Rito cover art by [?]. La cerimonia translated by Andrea Bonazzi. La cerimonia cover art by Ivo Torello. "The Carrion Gods in the Heaven"
Cover art by Claudia Noble. The collection won the 2014 Bram Stoker Award for best collection. It placed 8th in the 2014 Locus Awards in the collection category. It was nominated for the 2014 World Fantasy Award in the collection category. There is an errata for the book on Laird Barron's Official Site. Cover art by Matthew Revert. Cover art by Robert Grom. The audiobook is unabridged and narrated by Feodor Chin. It does not include "Blood and Stardust". Published as an exclusive chapbook as part of the Clockwork Phoenix 5 Kickstarter (funded in April 2015). 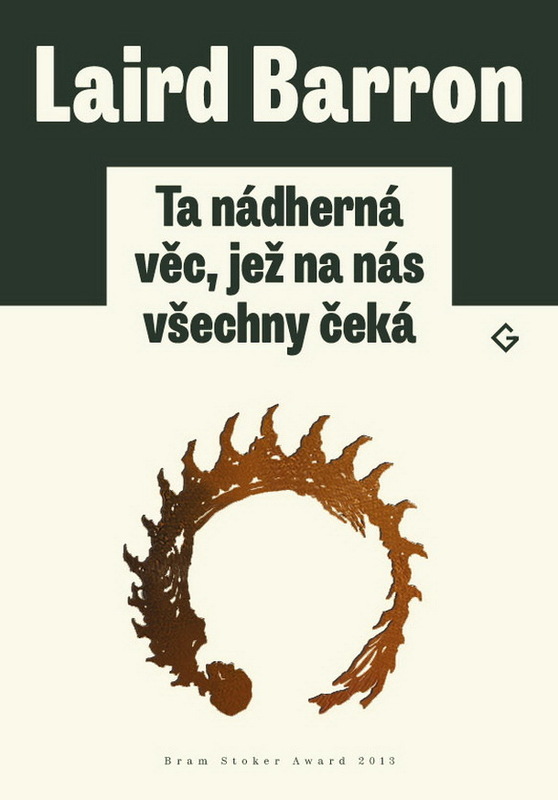 "Andy Kaufman Creeping Through the Trees"
This is a Czech language edition of Occultation and Other Stories. This is a Czech language edition of The Beautiful Thing That Awaits Us All and Other Stories. "Isaiah Coleridge is a mob contract killer in Alaska. As you’d expect, he’s pretty tough, seen a lot, dished out more. But a walrus slaughter proves too much for him, and he puts a stop to it. Too bad the hunter shooting the walruses is a made guy. Isaiah finds himself in the kind of trouble that gets you a bullet behind the ear. That’s not the way it plays out, but only because he’s rescued by the one man he doesn’t want to see: his father. The projected release date was 2016 [Official site]. Crime novel to be published by G.P. Putnam's Sons.